Fraser Firs originated in the Appalachian Mountains of the southeastern United States. The needles are dark green with silvery undersides. The species is known for their upright branching, excellent needle rentetion, and straight stems. The branches are strong, making this an excellent species for decorating. Learn more about the Fraser Fir species in thisvideo. The Douglas Fir specices originated in western North America. This species has soft, light green needles. This tree is able to withstand frigid temperatures, making it an excellent selection for Michiganders. The branches are not as strong as other species, so it is not recommended for strong ornaments. This is an excellent budget-friendly. Learn more about this species in this video. The Scotch Pine is a very common choice. This species doesn't loos their light green needles when they're dry, providing excellent needle retention. These trees have an excellent survival rate. These trees are a great choice for budget-concious consumers, too. Watch this video to learn more. The Colorado Blue Spruce, or just Blue Spruce, is a common selection due to their bright blue needles. However, the needles on this tree are very sharp. The stiff branches make it great for decorating. Watch this video to learn more about this species. Balsam Firs have a dark, green appearance and their pleasant fragrance lasts through the holiday season. The soft needles and a straight stem, making this a traditional favorite for many. The Concolar Fir trees have long, narrow, bluish green needles that have excellent retention. One of the best feature of this species is the citrus-like scent of the needles. Watch this video for more information. 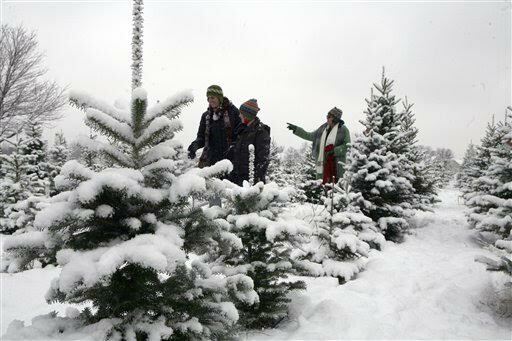 Canaan Fir shares many similiarites with Fraser Fir and Balsam Fir. It has dark green to bluish green needles. Watch this video to learn more about Canaan Fir. The White Pine is the largest pine the U.S. White pine is a large, quickly growing species. The needles are soft and flexible with a bluish green color. This tree is not recommended for heavy ornaments. This is a great choice for budget concious consumers searching for a large tree. Visit our Christmas Tree Species Pinterest board to learn more about the various species. Find your perfect real tree at a choose and cut farm, retail lot, or wholesale farm near you.